Looking for the top products for fleas and ticks? Perfect. In this Pest Strategies guide we'll be covering. And Our Top Products To Keep Fleas and Ticks Off Your Pets! How does flea and tick prevention work? How to prevent flea and ticks from getting on your pets? How To Prevent Fleas and Ticks For Dogs? How To Prevent Fleas and Ticks For Cats? How to prevent fleas and ticks around your yard? Here is a rundown of the top contenders in the field right now, but first, a bit more information on flea and tick prevention. The two pests that wreak the most havoc for our pets are fleas and ticks. They bother us year-round, but as spring turns to summer, it’s prime time to prepare for the yearly ambush. Fleas and ticks are biting, bloodsucking, and irritating and they can cause dangerous diseases like anemia, tapeworms, Rocky Mountain Spotted Fever and Lyme disease. The most important thing to understand for effective prevention of fleas and ticks is how fleas and ticks find and attach to your pet. Most fleas attach to your pet outside of your home. You may bring fleas in on your pants leg or your shoe, or you could have a visiting dog that brings fleas in, but usually, fleas ride into your home on your dog or cat. Once an adult female flea has had a blood meal, she starts laying eggs. These eggs fall off of other animals and land in your yard. Fleas can be on a wide variety of mammals that scurry across your lawn. The eggs soon hatch into larvae. These tiny worm-like pests evolve into cocoon-covered pupae. This is the point at which fleas are most likely to find their way onto your pet. When the pupae are ready to hatch, the young fleas immediately seek out a host and a meal. Vibrations on the ground, heat, and carbon dioxide signal to the pupae, “Hey, come on out, here’s some food!” and the cocoons hatch. Your innocent pet just happens to be in the wrong place at the wrong time. Fleas will jump up on humans for a snack to help them get by, but they continue to see out their ideal host, which is your pet or another small mammal. Most people think ticks jump or hide out in trees waiting to fall on animals and people when they pass by. It seems this way because of the strange places we find ticks, like in our hair. Ticks are most commonly found in tall grass, weeds, and bushes. As we come hiking through with our pets, we brush against them where they attach. Ticks can go without a meal for a full 3 years so there are many out there waiting patiently for the opportunity to eat. Once they are on board, they bite and begin to feed with the help of a secreted glue-like substance that keeps them firmly attached. Flea and tick prevention is critical for maintaining the health of your pet. The first thing to know is that you should use an Integrated Pest Management (IPM) approach for prevention. This means you need to consider all of the areas where your pet could pick up fleas and proactively monitor them for activity. You also should use pesticides when needed, but not unnecessarily. Learning about the common pests in your area, understanding their life cycles, and responding appropriately to prevent infestations are recommendations to keep your pets and your family safe. If you don’t have a flea infestation, you may not want to give your dog pest control medications and formulas designed to kill fleas. These products include strong pesticides and chemicals for eliminating outbreaks. You may prefer gentler repellents or all-natural products without synthetic substances. Pet owners need to be careful to not use too many pest control products at once. Read Also: What're the best flea collars for dogs? A flea collar, flea spray, lawn treatment, and in-home spray can easily be too many toxins for your dog to handle. Using natural options when you can gives you some peace of mind. The trade-off is that you may need to apply these products more often, and make a commitment to carefully watch your dog for fleas. Read Also: What're the best tick collars for dogs? The most important thing to know here is that you should not use dog formulas on your cat. Dog products contain higher concentrations of pesticides, which can be deadly for cats. Read Also: What're the flea collars for cats? Some common ingredients in all-natural products are essential oils like lemongrass, clove, cinnamon, and peppermint. Cats don’t have the capability to break down larger amounts of these compounds as quickly as dogs and humans. Cats become overwhelmed and can succumb to the toxicity. Always choose a product specifically formulated for cats and always ask your veterinarian which products would work best for your situation. There are cat products that take into account the fact that most cats don’t like water. Fine mists, wipes, collars, drops, or powders may work better than bathing depending on your cat and how many scratch marks you are willing to endure. Yards and outdoor areas are often overlooked when it comes to flea and tick prevention. Here are a few simple yard tips to keep pests at bay. Keep a 3 foot buffer between your yard and surrounding bushes or woods. You can cut the grass very short here or use mulch or gravel to fill it in. ​Make sure your yard is free from debris such as wood piles, cardboard, and lawn trimmings. Pests flourish in these areas. ​Mow your lawn regularly and don’t allow the grass to get high. ​Consider plants that naturally repel pests. ​Keep your yard dry. Pests like moist environments. 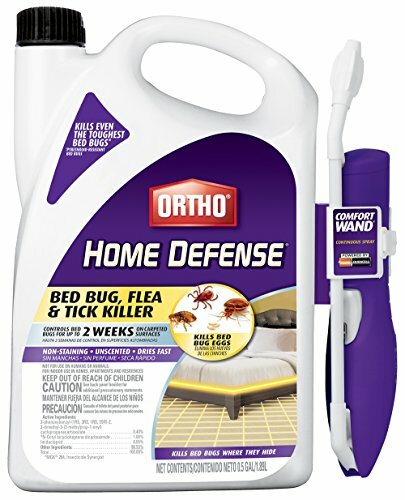 Here are a few reviews of some popular flea and tick prevention products. For the products listed for dogs, there are also versions for cats available as well. This product is a spot-on treatment that comes with vials of drops. You place these drops on the back of your dog’s neck once per month. These topical treatment drops have Imidacloprid, Permethrin, and Pyriproxyfen to kill fleas, ticks, eggs, and larvae. 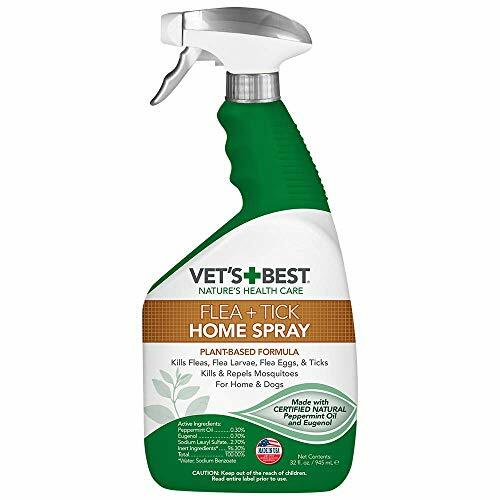 Vet’s Best Flea and Tick Home Spray is an environmentally safe and all-natural product that kills fleas, ticks, and flea eggs. This spray does not have pyrethrins, permethrins, or cedar oil, which are a few ingredients that can irritate sensitive dogs. You can use Vet’s Best on your dog, their bedding, your home, your yard, and yourself. It is effective as a repellent and pesticide, but essential oils are volatile and evaporate quickly so you have to use it repeatedly and as needed. 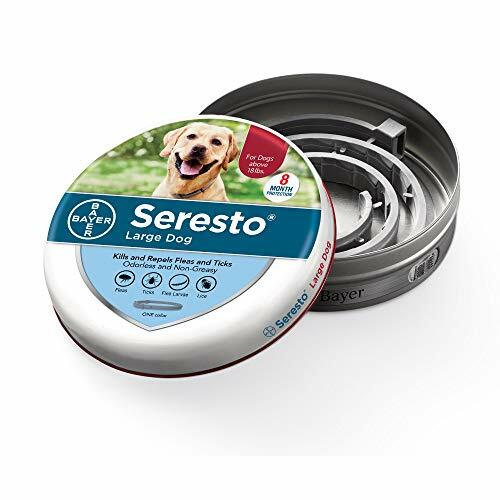 As a more recently available product, the Seresto Flea and Tick Collar for Dogs is comparable to monthly topical applications and spot-on treatments. It is the first collar in many years that offers an effective alternative to having to remember to put drops on each month. The collars are non-greasy and unscented and provide flea and tick control for up to 8 months. This product is spread across lawns for multiple insect control, including fleas and ticks. Do not get the product on your skin as it can cause itching. Once the product is on the lawn, you activate it with a spraying of water. You must wait until your lawn is completely dry before anyone uses it again. Wear light pants tucked into white socks when applying this product. You will be able to see fleas and ticks on you and can remove them before you go back inside. This is another all-natural product that comes in a powdered form which may be easier to apply to some animals. The ingredients are Diatomaceous earth, Neem leaf powder, and yarrow flower powder. You can also sprinkle Pest Peeve on floors, baseboards, bedding, furniture, and carpeting and vacuum it the next day. 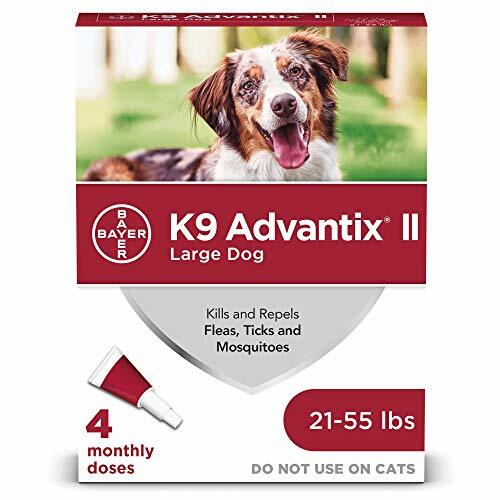 If you absolutely need to prevent pests and you are not as concerned about chemical pesticides, Bayer K9 Advantix II, Flea And Tick Control Treatment will likely work best in preventing a flea or tick problem on your pet. The insecticides are effective for repelling fleas and ticks, and should one make its way on your pet, they aren’t going to last very long. When chemical and sensitivities are a concern, the other listed products, or a combination of them, will do the trick with a little more effort. For the sake of your pet, I would personally stick with using a few natural products and spend more time brushing and vacuuming to monitor any activity. Then if I saw anything, I would switch to chemical insecticides. Curious about other flea and tick related products? Check out our other detailed guides to help you deal with your pest problems.